Come serve a summer at CrossTimbers! Think you have what it takes to be a CrossTimbers Staffer!? Energetic, servant-minded, hilarious, role model…these are just a few words describing our staff! As a CrossTimbers staffer you will be serving as a summer missionary. This is a fast paced highly relational opportunity where staffers have the opportunity to build relationships with children and hopefully play a part in impacting a child’s life for Christ. Special interviews, screening, and background checks are used to hire staffers that are committed Christians with a desire to serve. Staffers are thoroughly trained and certified so that they have the skills to carry out their roles on our summer staff. CrossTimbers staffers interact with the children all through the day. Each staffer is asked to lead a small group, an activity, and a mission stop. 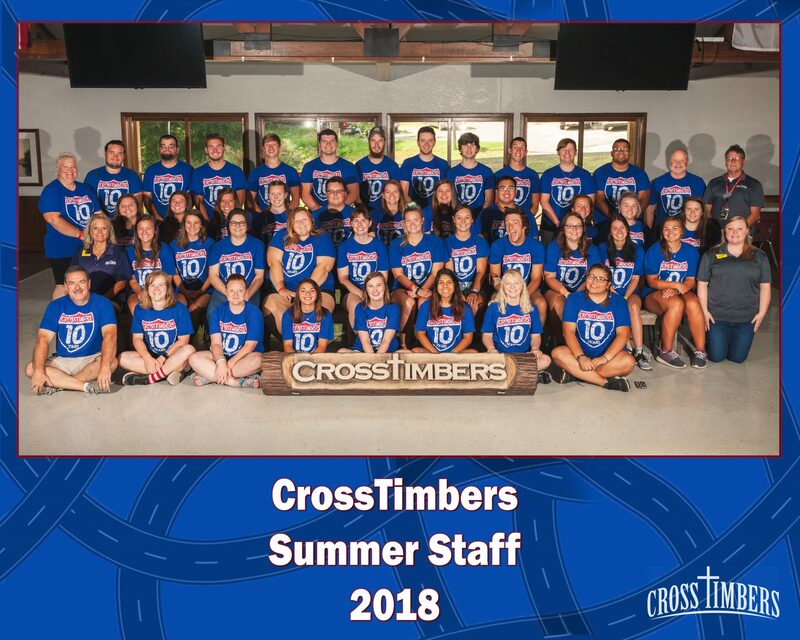 Check out the CrossTimbers Staff Info and Expectations for more details about becoming a CrossTimbers Staffer! CrossTimbers camp applications will be received till January 1st. For any questions contact the CrossTimbers program office. Room and Board is provided all summer long for staffers. Lodging is dormitory-style, so bring your own bedding! Meal times are shared with campers to develop another witnessing opportunity! Compensation for summer service is comparable to full-time, minimum wage jobs. Do you enjoy teaching biblical truths? Each summer staffer will help lead a “tribe” of 8-12 campers of their same gender. What an opportunity to serve one-on-one with campers! Your spiritual health over the summer is a huge priority! Staffers will be poured into daily by staff disciplers, mentorships, and weekly staff worship services. You will be contacted to schedule an interview (primarily during our interview weekend). Keep this weekend available to schedule your interview. Look over the important staff dates listed below and confirm that you are available for all important dates required for employment. Staff decisions are made within two to three weeks following the interview weekend. You will know the status of your employment (whether you have been hired OR not) after decisions are made. During this time you will be trained on all areas of camp to make you completely prepared to lead children and sponsors. This time is about more than technical lifeguard and ropes course training we really focus on working with children and children’s evangelism. Camp weeks are 4 days long and in most cases these weeks don’t line up with calendar weeks. Please consult the registration page to see dates of actual camp weeks. Returning staffers will need to fill-out the application that is linked above. This year the same application will be used for new and returning staffers. We will conduct phone interviews with all returning staffers and for the application you will need three references.